Living and working in the city can be somewhat exhausting, especially with the endless stream of stressors, pollutants and pressure. At times, it can be too much to handle and in turn, become outright life draining. That’s why you need something that can help you stay strong and resilient throughout the day’s ordeals – what you need is Vitamin C! Contrary to popular belief though, not all Vitamin C supplements are created equal. Studies show that the immune system weakens due to the onset of stress. This explains why our bodies get weak and become susceptible to illness. However, we can greatly reduce that possibility by taking Vitamin C daily. According to Dr. Oz’s website, Vitamin C is able to “quickly clear out cortisol – a primary stress hormone.” Because of Vitamin C’s ability to regulate stress, it becomes the necessary and most convenient way to alleviate stress on those hectic work days. Vitamin C is regarded by many as a “cure all” for most ailments, because its primary function is to boost the immune system, protecting the body from flu, cough, bronchitis and other viral and bacterial infections. Aside from this, it also acts as a potent anti-oxidant. Finally, Sodium Ascorbate FERN-C also promotes healthy gums, teeth, bones and other connective tissues. It is a common misconception that Vitamin C comes only in one form – Ascorbic Acid. The truth is there is in fact another form of Vitamin C called Sodium Ascorbate and it is actually superior to Ascorbic Acid in areas where it counts. For one, Sodium Ascorbate dissolves faster upon ingestion. This means that the body reaps the benefits of Vitamin C faster, enabling it to quickly act on stress. In addition to that, Vitamin C Sodium Ascorbate supplements are non-acidic and thus better tolerated. Unlike Ascorbic Acid which causes stomach discomfort unless taken with meals, Soduim Ascorbate can be taken on an empty stomach. With its pH level at 7.5 to 7.8, Sodium Ascorbate FERN-C is alkaline-based to neutralize acidity in the stomach. This makes it the perfect vitamin for those with hyper-acidity, and people whose schedules cause irregular sleeping and frequent meal skipping. 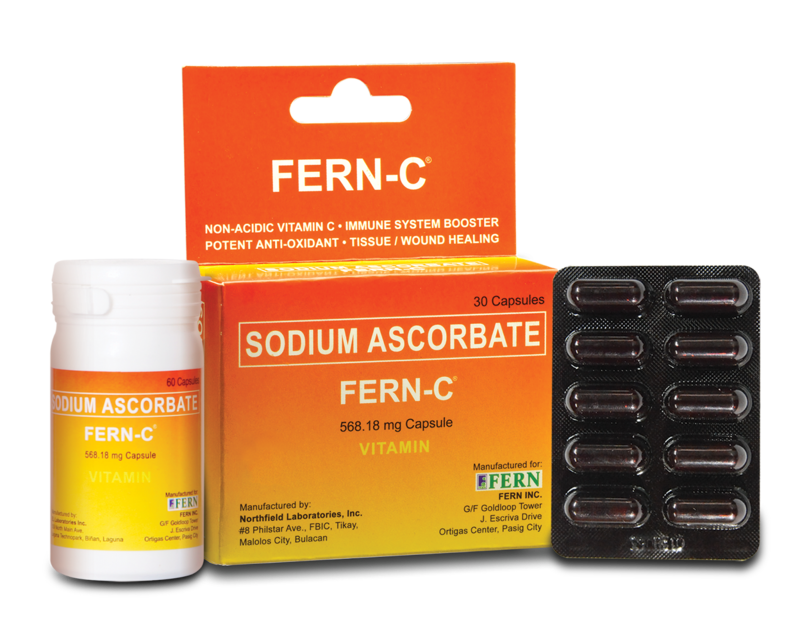 The good news is that the number one Vitamin C Sodium Ascorbate brand in the Philippines, FERN-C, which used to be available only via multi-level marketing, is now on sale via retail. The quality of FERN-C is assured because each pack is certified with the Quali-C seal, as the Sodium Ascorbate which is the active ingredient of FERN-C was developed and it manufactured by DSM, the only European Vitamin C manufacturer. Despite the limitations of the MLM distribution scheme, FERN-C is the number one Sodium Ascorbate brand in the country, and well and truly “subok na” among its faithful users. FERN-C is now available in major drugstores nationwide. I've heard many good things about Fern C. It's something I need on a daily basis too because I'm night shift. Nothing like vitamins to keep my immune system up. After I was discharged from the hospital a year ago, I made sure to have vitamins so I can keep with the life's activities. My ninang recommended Fern-C because it is effective as she said. Truthfully, it was effective. From then on, I never skipped Vit C supplements. I'm not familiar with this product. I haven't heard of it before. I never take any supplements/ vitamins actually. Less stress sounds good though. Have you tried it yourself? For how long? I use it daily but skipped this time because of my pregnancy, I am taking a different form of multivitamins that's why I need to stop this first. I will resume with my Vit. C afterwards. Since it's so expensive to get sick, I always have Vitamin C before. I learned my lesson and got my daily dose of Vit. C from Fern-C and I say it is effective than the ascorbic ones. I prefer sodium ascorbate. I am a FernC user.. for someone like me who always work on graveyard, i really need a boost and Fern C is really effective for me..and there is no overdose here too right? Yup! When I was so sick before, I dissolved 6 capsules of this in my drink and the next day, I was so relieved. Good thing my colleague (who happens to be my ninang) recommended this. I'm a big fan of vitamins! Might have to check this out!! This is available in our country. Not sure if you have it there. Sodium Ascorbate is different from Ascorbic and I think that's why many people are recommending this better than other brands. I guess it's not available in your country. I think I used Fern C for almost 2 years back then. But now I switch to a high dosage Vitamin C to keep myself energize and healthy. Great to know that you also love this one! Yup. I think it's really effective. It's always good to boost our organism with a bit of vitamin C. And if we can't get it from fruits, we can always get it from supplements. I always try to get it from fruits too! You can get this easily in all drugstores nationwide. Yep. Vitamin C is also god for brightening the skin and making it look young. Natural are the best for me too!